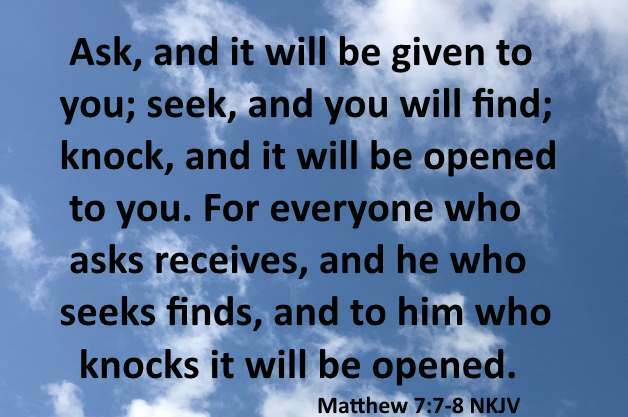 “Ask, and it will be given to you; seek, and you will find; knock, and it will be opened to you. For everyone who asks receives, and he who seeks finds, and to him who knocks it will be opened (Matthew 7:7-8 NKJV). And whatever things you ask in prayer, believing, you will receive (Matthew 21:22 NKJV). Now this is the confidence that we have in Him, that if we ask anything according to His will, He hears us. And if we know that He hears us, whatever we ask, we know that we have the petitions that we have asked of Him (1 John 5:14-15 NKJV). Therefore I exhort first of all that supplications, prayers, intercessions, and giving of thanks be made for all men, for kings and all who are in authority, that we may lead a quiet and peaceable life in all godliness and reverence (1 Timothy 2:1-2 NKJV). Is anyone among you sick? Let him call for the elders of the church, and let them pray over him, anointing him with oil in the name of the Lord. And the prayer of faith will save the sick, and the Lord will raise him up. And if he has committed sins, he will be forgiven. Confess your trespasses to one another, and pray for one another, that you may be healed. The effective, fervent prayer of a righteous man avails much (James 5:14-16 NKJV). Then you will call upon Me and go and pray to Me, and I will listen to you. 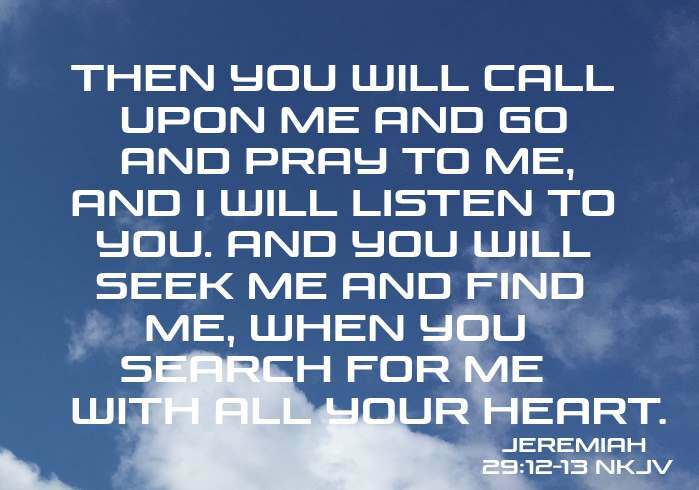 And you will seek Me and find Me, when you search for Me with all your heart (Jeremiah 29:12-13 NKJV). Therefore I say to you,whatever things you ask when you pray, believe that you receive them, and you will have them. And whenever you stand praying, if you have anything against anyone, forgive him, that your Father in heaven may also forgive you your trespasses. But if you do not forgive, neither will your Father in heaven forgive your trespasses. But if you do not forgive, neither will your Father in heaven forgive your trespasses (Mark 11:24-26 NKJV). Seek the Lord and His strength; Seek His face evermore (1 Chronicles 16:11 NKJV). Watch and pray, lest you enter into temptation. The spirit indeed is willing, but the flesh is weak (Matt 26:41 NKJV). In this manner, therefore, pray: Our Father in heaven, Hallowed be Your name. Your kingdom come. Your will be done on earth as it is in heaven. Give us this day our daily bread. And forgive us our debts, As we forgive our debtors. And do not lead us into temptation, But deliver us from the evil one. For Yours is the kingdom and the power and the glory forever. Amen (Matt 6:9-13 NKJV). And in that day you will ask Me nothing. Most assuredly, I say to you, whatever you ask the Father in My name He will give you. Until now you have asked nothing in My name. Ask, and you will receive, that your joy may be full (John 16:23-24 NKJV). Praying always with all prayer and supplication in the Spirit, being watchful to this end with all perseverance and supplication for all the saints (Ephesians 6:18 NKJV). Then He said to His disciples, "The harvest truly is plentiful, but the laborers are few. Therefore pray the Lord of the harvest to send out laborers into His harvest (Matthew 9:37-38 NKJV)." Let us therefore come boldly to the throne of grace, that we may obtain mercy and find grace to help in time of need (Hebrews 4:16 NKJV). I desire therefore that the men pray everywhere, lifting up holy hands, without wrath and doubting (1 Timothy 2:8 NKJV). If you ask anything in My name, I will do it (John 14:14 NKJV). But you, when you pray, go into your room, and when you have shut your door, pray to your Father who is in the secret place; and your Father who sees in secret will reward you openly (Matthew 6:6 NKJV).